The notion that the Falastinians, aka; “Palestinians” are a people is a lie that has lived on through the ages perpetuated by world leaders, the so called main stream media, and our own government. A statement by Arabs For Israel. Most of us would agree that is a powerful statement which contradicts many teachings in the Muslim world. Globally Muslims and non-Muslims alike condemn the Jews. There have been many articles, essays, and documents calling for and supporting the complete annihilation of the tiny country of Israel, and wiping the Jews from the face of the earth. Anti-Semitism has been with us for a very long time, indeed it almost seems in vogue or fashionable these days to “blame” the Jews for all the troubles in the Middle East. Israel is tiny by comparison to her neighbors, literally surrounded by 22 Arab nations with a land mass hundreds of times the size of Israel. For statistics and maps go here. Where is “Palestine” and who are the “Palestinians”? The recent land for peace endeavor in Annapolis, Maryland is a delusional legacy project doomed to fail as all other peace initiatives have over the past several decades. In recent weeks the disturbing news that governments and international groups have pledged $7.4 billion dollars over the next three years to the “Palestinians”. Since when does “throwing” money at terrorists bring about peace? Especially since their stated purpose is to “wipe Israel off the face of the earth”. The question begs an answer. The Madrid Summit of 1991was another pathetic attempt to bring about peace in the Middle East. This proposed peace deal brought about the destruction of the Israeli economy and insured the ever increasing terrorist acts of violence that have continued to this day. Nearly everyday for the past several years Israel has received rocket attacks and other acts of violence. A peaceful gesture by the falsely named “Palestinians”? The Madrid Summit failed to achieve the peace intended, so will the Annapolis conference and giving money to aid and abet terrorists. What these people fail to recognize is basic to understanding a complicated problem. Perhaps the following will help dispel some of the myths of “Palestine” and a so called “Palestinian” people. Many myths have been handed down through the ages about these people. The word “myths’ is perhaps too kind in my opinion. In reality they are nothing more or less than lies. Tell the lies often enough and long enough and the majority will begin to believe them. The fact is there is no such land as “Palestine”, neither is there a race of people called “Palestinians”. — Professor Bernard Lewis Princeton University Quote taken from Commentary Magazine, January 1975. “Palestine has never existed . . . as an autonomous entity. There is no language known as Palestinian. There is no distinct Palestinian culture. There has never been a land known as Palestine governed by Palestinians. Palestinians are Arabs, indistinguishable from Jordanians (another recent invention), Syrians, Lebanese, Iraqis, etc. More here from Joseph Farah. There is no recorded history of “Palestine”. It has never been a state or a nation. The word itself is derived from “Peleshet” and frequently appears in the Bible. During the thirteenth century BC, a people commonly referred to as the “Sea Peoples” migrated from the Aegean Sea and Greek Islands settling in the southern coastal land of Canaan. Five independent city-states, including Gaza, were established and came to be known as “Philistia”. The Romans and Greeks of the time called it “Palestina”. Philistines are not Arabs, certainly not Semites and had no connection ethnic, linguistic or historical to Arabia or Arabs. The Arab pronunciation of “Palestina”, a Greco-Roman name, is “Falastin”. For more detail on this please go here and here. A more detailed look into the “myths” can be found here. –Avi Davis, World Net Daily. “Today, most of the Arab/Islamic world focuses its genocidal hatred on the Jewish State exactly as Europe once focused this same hatred on the individual Jew. There is now no greater Jewish responsibility than to prevent a second Holocaust… and it is nothing short of a Holocaust that the Arab/Islamic world now wishes and plans for Israel.” –Louis Rene Beres, 9/9/04 Lecture to the Dawn R. Schuman Institute. No links available. The .pdf can be found here. The War in the Middle East is nearly sixty years old. Most people alive today are unfamiliar with its history and origins and lack knowledge of its facts. This state of ignorance provides a fertile ground for the unscrupulous to create myths that will justify their destructive agendas. The political propaganda machine has created many such myths to fuel their war against the Jewish state. Israel is the only democracy in the Middle East that elects its lead­ers in free elections and guarantees rights to its citizens, and honors those rights. Yet Israel is the target of those who claim to be fighting for “human rights.” There are about a million and a half Arabs living as citizens in Israel who elect representatives to Israel’s parliament and who have more rights than the Arab citizens of any Arab state. Yet Israel is the target of those who claim to be fighting for “social justice.” Israel’s very creation is referred to by its Arab enemies as “the Nakba”, or the “catastrophe,” the clear implication of which is that Israel should not exist. Yet Israel is the target of those who claim to support self-determination and oppose genocide. Israel was the victim – at its very birth — of an unprovoked aggression by five Arab mon­archies and dictatorships. It has been the target of an Arab war that has continued uninterruptedly for nearly sixty years because the Arab states have refused to make peace. Yet Israel is the target of those who say they want “peace.” Israel is the victim of terrorist attacks – sui­cide bombings – which along with the Jews they mark for extinction, kill Palestinian women and children as well. They can through the creation of political myths that rationalize aggression and justify war against civilian populations. Yasser Arafat may have lost some of his personal political clout of late, but the political movement he began – demanding justice for Palestinian Arabs expelled from their homes in 1948 – remains as strong as ever. “The fact that there are these refugees is the direct consequence of the act of the Arab states in opposing partition and the Jewish state. The Arab states agree upon this policy unanimously and they must share in the solution of the problem.”– Emile Ghoury, secretary of the Palestinian Arab Higher Committee, in an interview with the Beirut Telegraph Sept. 6, 1948. “The Arab state which had encouraged the Palestine Arabs to leave their homes temporarily in order to be out of the way of the Arab invasion armies, have failed to keep their promise to help these refugees.”– The Jordanian daily newspaper Falastin, Feb. 19, 1949. “Who brought the Palestinians to Lebanon as refugees, suffering now from the malign attitude of newspapers and communal leaders, who have neither honor nor conscience? Who brought them over in dire straits and penniless, after they lost their honor? The Arab states, and Lebanon amongst them, did it.”– The Beirut Muslim weekly Kul-Shay, Aug. 19, 1951. “The 15th May, 1948, arrived … On that day the mufti of Jerusalem appealed to the Arabs of Palestine to leave the country, because the Arab armies were about to enter and fight in their stead.”– The Cairo daily Akhbar el Yom, Oct. 12, 1963. The intent of this article is not to prove my opinion. It is posted here to promote thinking for yourself and to provide a historical look at the serious problems we face when attempting to reveal the truth about this subject. As I stated earlier tell a lie often enough and long enough and soon it becomes the “new” truth. The subject is complicated to say the least and this one article cannot possibly hope to dispel the myths and the lies we have come to accept as fact. It is a start. All I ask of you the reader is digest this with an open mind and follow the links. There are more to follow. Some of the material cited above is found in the book From Time Immemorial by Joan Peters. Other sources include Professor Bernard Lewis, Princeton University and his book “The Middle East, A Brief History of the Last 2000 Years”. Joseph Farah Arab-American journalist and his book “Myths of The Middle East” also the CEO of World Net Daily. Palestine Facts Note: There are several links here that cover a wide range of time periods. Be prepared to spend a little time reading. For over 3,300 years of history, Jerusalem has been a capital city for only the Jewish People. Jews have always lived in Jerusalem, except when they were massacred or driven out. There has, however, been a nearly unbroken Jewish presence in Jerusalem for the past 1,600 years. And since the early 1800’s, the population of Jerusalem has been predominantly Jewish. Even when the Jordanians captured and occupied Jerusalem from 1948-67, they (the Jordanians) never sought to change it to their capital (replacing Amman) nor make it the capital of all Arab-“Palestinian” people. Even during the 19 years Jordan “occupied” most of Jerusalem, Arab leaders from other Arab countries hardly ever bothered to visit this city! Only to the Jews has Jerusalem ever held special meaning! The reality is that Jerusalem was never an Arab capital and that it never was, until the Jews revitalized it, a dusty provincial city that hardly played and economic, social or political role. Another myth deals with the issue of Jerusalem and its Temple Mount. The myth is that Jerusalem is really an Arab city and that it is a central focus of Islam. The truth is that the Arabs expressed very limited interest in the Temple Mount before 1967 after the Six-Day War. Besides, Mecca and Medina (both in Saudi Arabia) are Islam’s holiest cities! Islam’s Holy(?) Koran mentions Mecca 2 or 3 (implied, but not actually written) times. It mentions Medina 5 times. It never mentions Jerusalem and with good reason. There is no historical evidence to suggest Mohammad ever visited Jerusalem! And if he did visit Jerusalem, it could not have been until 6 years after his death. Therefore, the notion that Mohammed ascended to Heaven from a rock in Jerusalem (today’s Dome of the Rock) is even more ridiculous! One more thing about Jerusalem in general and its Temple Mount in particular. Jerusalem appears in the Jewish Bible 669 times and Zion (which usually means Jerusalem, sometimes the Land of Israel) 154 times, or 823 times in all. The Christian Bible mentions Jerusalem 154 times and Zion 7 times. All told, in the Old Testament (the Hebrew Bible) and the New Testament, the terms “Judah” or “Judea” appear 877 times, and “Samaria” is used on 123 occasions. Hold on to your hats, everybody. It gets even better. Upon closer look at their Holy Koran, we have uncovered something quite amazing. These Muslims may actually be more Jewish than Muslim! Get this… the Koran mentions “Israel” [or “Israelites”] 47 times, “Jew” or “Jewish” 26 times! Even “Christian” or “Christians” gets 15 mentions! OK, so maybe Mohammed just forget to mention “Jerusalem”. Maybe he also forgot to mention the Haram-esh-Sharif, their name for Judaism’s Temple Mount. Perhaps it was an honest oversight. That desert heat can do strange things to one’s brain. But surely “Palestine” is mentioned all through the Koran. After all, the poo’ poo’ ancient “Palestinians” go way back, right? WRONG. “Palestine” and “Palestinian” are nowhere to be found. Perhaps that’s because these so-called Arab “Palestinians” have ancient historical roots going ALL THE WAY back to June 1967! So much for the Arab, Muslim or “Palestinian” ancient religious or physical connections to a single ounce of turf in the so-called “occupied” territories! From 1948 to 1967, when East Jerusalem and the Temple Mount were “occupied” by Jordanian Forces following the 1948-9 Arab-Israeli War, Jerusalem itself was ignored by the Arab world. No Arab leader ever paid a visit, not even to pray at the al-Aqsa Mosque or the Dome of the Rock (both located on the JEWISH Temple Mount). Also noteworthy during this 19 year period of Jordanian occupation’ no Jews were allowed there… not that there was much for them to see since the Arabs destroyed 58 of Jerusalem’s Jewish synagogues! Even the Arabs of “Palestine” placed so low a priority on Jerusalem that the PLO’s founding charter, the 1964 Palestinian National Covenant, made no reference whatsoever to it. Only when the Jews recaptured it after the 1967 “Six Day War” (initiated by the Arabs) did the Arab world SUDDENLY grow very passionate about Jerusalem! In truth, the Dome of the Rock and the Al-Aqsa mosques are just but two of hundreds of thousands of Muslim mosques around the world. Except for these two minor mosques, Jerusalem itself has no major Islamic significance. In fact, far more Christian shrines are in Jerusalem than Muslim ones! When a Jew prays from anywhere in the world, he faces the Temple Mount in Jerusalem. When a Moslem prays, even while IN Jerusalem, he faces Mecca, Saudi Arabia (1,300 miles away due east!). So in many cases, even when a Moslem is in Jerusalem, his “hind quarters” are facing these two Jerusalem mosques! What does THIS tell you! And when Islamic suicide bombers try to take apart Jerusalem piece by piece, what does THAT tell you! In order to have a “New” Middle East, There needs to be new Arabs! If you believe what you read in most news sources, Palestinians want a homeland and Muslims want control over sites they consider holy. Simple, right? Well, as an Arab-American journalist who has spent some time in the Middle East dodging more than my share of rocks and mortar shells, I’ve got to tell you that these are just phony excuses for the rioting, trouble-making and land-grabbing. What about Islam’s holy sites? There are none in Jerusalem. Shocked? You should be. I don’t expect you will ever hear this brutal truth from anyone else in the international media. It’s just not politically correct.I know what you’re going to say: “Farah, the Al Aqsa Mosque and the Dome of the Rock in Jerusalem represent Islam’s third most holy sites.” Not true. In fact, the Koran says nothing about Jerusalem. It mentions Mecca hundreds of times. It mentions Medina countless times. It never mentions Jerusalem! With good reason. There is no historical evidence to suggest Mohammed ever visited Jerusalem. So how did Jerusalem become the third holiest site of Islam? Muslims today cite a vague passage in the Koran, the seventeenth Sura, entitled “The Night Journey.” It relates that in a dream or a vision Mohammed was carried by night “from the sacred temple to the temple that is most remote, whose precinct we have blessed, that we might show him our signs.” In the seventh century, some Muslims identified the two temples mentioned in this verse as being in Mecca and Jerusalem. And that’s as close as Islam’s connection with Jerusalem gets — myth, fantasy, wishful thinking. Meanwhile, Jews can trace their roots in Jerusalem back to the days of Abraham.The latest round of violence in Israel erupted when Likud Party leader Ariel Sharon tried to visit the Temple Mount, the foundation of the Temple built by Solomon. * It is the holiest site for Jews. Sharon and his entourage were met with stones and threats. I know what it’s like. I’ve been there. Can you imagine what it is like for Jews to be threatened, stoned and physically kept out of the holiest site in Judaism?So what’s the solution to the Middle East mayhem? Well, frankly, I don’t think there is a man-made solution to the violence. But, if there is one, it needs to begin with truth. Pretending will only lead to more chaos. Treating a 5,000-year-old birthright backed by overwhelming historical and archaeological evidence equally with illegitimate claims, wishes and wants gives diplomacy and peacekeeping a bad name. * Note: We beg to differ with Joseph Farah on this one point.The violence started the day BEFORE Sharon went up to the Temple Mount.In fact, the Arab Violence was planned months before after the failed Camp David.Sharon didn’t just go to the temple mount. He applied for a permit from the waqf. The Arabs knew he was coming and planned the intafada accordingly!There was nothing spontaneous about the Arab violence! Joseph Farah, a Christian Arab-American journalist, is the editor and chief executive officer of WorldNetDaily.com, a leading independent news site. Please note: Some of the links provided will direct you to the web site this article was copied from. In the event you decide to have a look around this site please be advised that some of the material contained therein is intensely graphic. I would not recommend allowing children to view them. The Jews did not displace anyone, because very few of the people who were there actually owned the land. Most were absentee owners residing elsewhere. Another fact hardly mentioned by the “new historians” is that the arriving Jews never threw anyone off any land. All land was purchased legally from the original owners… whether they be from “Palestine” itself or elsewhere. Furthermore, top dollar was paid for this land which, in many cases, was uninhabited and hardly more than swamp land and rocky terrain. Only about 120,000 Arabs resided in an area that now comprises the State of Israel, Jordan and the so-called “West Bank” [Judea and Samaria] in between. By 1890, the number of Jews who had settled in Palestine reached 50,000 and, by 1907, numbered 100,000. In Jerusalem alone the Jews numbered more than 25,000, out of a total population in the city of only 40,000 Jews, Christians and Arabs. The Arabs did, however, constitute a majority over the sparsely populated countryside abutting Jerusalem. From 1888 until 1915 there were about six locust plagues that made the land nearly uninhabitable. In the 1915 locust plague alone some 40,000 people died and large numbers of Jews and Arabs left the land. Those that returned did not do so until about 1922 when the Zionist money to reclaim the land started coming in and a pipe line was laid. Then both Arabs and Jews started to come in in large numbers. Palestine’s early Jewish Zionists were idealistic pioneers who arrived in pre-state Israel with every intention of living in peace alongside their Arab neighbors and upgrading the quality of life for all of the land’s inhabitants. These pre-Israel Zionists (and later, Israelis) had tried to develop peacefully for the dual benefit of Jews and Arabs in the land. But the Arab leadership always, starting in the earliest days, took the low road of insisting that the only solution was for the Jews to get out, even if that meant continued poverty and stagnation. When Arab demands were not met, they always resorted to violence. The vast majority of Arabs came to the area after these early Zionist pioneers began draining the malaria-infested swamps (above photo) and plowing the land! In doing so, these Jews created the economic opportunities and medical availabilities which attracted Arabs from both surrounding territories and far-away lands! In fact, over 90% of the Arabs migrated there within the last one hundred years. Most of the Arabs in “Palestine” were interlopers and squatters originating from Syria, Jordan, Egypt, Iraq and other lands who simply took possession of pieces of land. So much for their unfounded claims that they have been there since “time immemorial!” These Arabs came from disorganized collections of tribes with a tradition of constantly terrorizing each other and trying to seize land from their neighbors. Many of them were social outcasts and criminals who could not find jobs in their own countries so they searched for their luck elsewhere. Unfortunately, those Arab immigrants imported into the Holy Land their age-old culture of terrorizing neighbors in order to seize land. In fact, today’s Arab “Palestinians”, let by Arafat and his PLO (sanitized to the PA, or Palestinian Authority…which is nothing more than A Network of Murderers Masquerading As Government!) are still nothing more than street thugs, bullies and ‘Little Saddams’ found elsewhere throughout most of the most Arab world. Yet while the returning Jews were highly motivated to restore the land, the Arabs seethed with envy and hatred for they lacked both the leadership to inspire and motivate them for they were, in fact, historical strangers to this land! Unlike the Jews, those Arabs who immigrated there had no ancient attachments to or historical memories of this homeland … this ancient Land of the JEWS! The real problem facing those Arabs today is not the lack of a homeland. The historical root-cause of their problem and frustration is the fact that the countries they came from have not agreed to accept them back in. This is why so many of them live, up until today, in refugee camps, in neighboring Arab countries, lacking fundamental civil rights. In their frustration they feel that the only hope and choice they have is to try and steal someone else’s country! There was no “Arab Palestinian” history before the Arabs manufactured one shortly after 1948, and then especially after the June 1967 Arab-Israeli War! In an interview with the Dutch newspaper “Trau” (March 31, 1977), PLO executive committee member Zahir Muhsein said, “The Palestinian people does not exist. The creation of a Palestinian state is only a means for continuing our struggle against the state of Israel for our Arab unity. In reality today there is no difference between Jordanians, Palestinians, Syrians and Lebanese. Only for political and tactical reasons do we speak today about the existence of a Palestinian people, since Arab national interests demand that we posit the existence of a distinct ‘Palestinian people’ to oppose Zionism. It is also been a “conceptual” war for ownership of the term “Palestinian” which has been transferred over to the Arabs whereas, before 1967, “Palestine” has always been synonymous with Eretz Israel and the Land of Israel. Archeological sites to this very day continue to yield artifacts with Hebrew writing, not some fictitious “Palestinian” or Arabic text! The so-called “Palestinian” Arabs were simply then, as they are now, Arabs no different culturally, historically or ethnically from other Arabs living in any of the 24 Arab countries from which they emigrated. The suggestion that the “Palestinians” are some sub-group of Arabs with their own unique identity is pure fiction! Great propaganda… but still pure fiction! And had not the Arabs continued to brainwash generation upon generation into believing this HISTORICAL HOGWASH about some ancient “Arab Palestinian” ties to the Holy Land, most could have gotten themselves a real life by now with much less bloodshed and suffering for everyone concerned! Remember: When we use their language (i.e. “West Bank” instead of Judea-Samaria, “occupied territory” instead of liberated Jewish lands, “settlements” instead of Jewish communities, “Palestinian” instead of Arab, “Haram esh Sharif” instead of the Temple Mount, etc. ), we are allowing the enemies of Israel to define the issues, create or distort history and control the debate. The Arabs and/or Muslims of today control 22 nations… 99½ percent of the ENTIRE Middle East land mass while Israel occupies only a 1/2 of 1 percent speck on this same map. But that’s still too much land for the Arabs to spare. They want it all. How often have we heard their familiar cry, “We will fight to our last drop of blood for for every last grain of sand!” And that is ultimately what all the fighting is about today. And no matter how many land concessions the Israelis might make for “peace,” it will never be enough! Any peace treaty between Israel and the Arab world are ultimately meaningless. The most recent 1993 “Oslo Peace Accord” has brought nothing but homicidal bombers into Israel. Even the Israeli-Egyptian and Israeli-Jordanian peace treaties are holding on by a single thread and, if you were to read their government-controlled newspapers, you’d think they were still at war with Israel! From the moment the Jewish People re-established sovereignty in their ancient homeland, they sought genuine peace with all of their neighbors. Unfortunately, their neighbors did not wish to share a peaceful existence with them. They, like Bin Ladin today, felt that they had a religious obligation to destroy the non-Arab/Muslim Jewish State (and, for that matter, ALL non-Arab/Moslem governments in the world). The Arab campaign against Israel is rooted not in any negotiable grievances but in a basic opposition to the very existence of Jewish sovereignty in what they perceive as THEIR Middle East! The ultimate intent of the Arabs is to separate out a Jewish history from “Palestine”… and then to separate Israel from the face of the Earth. When the Palestine Liberation Organization’s (PLO) was formed in 1964, its primary goal was to destroy Israel. After the 1967 Arab-Israeli war, their goal became two-tracked: Either (1) destroy Israel outright (the same pre-1967 goal) or (2) the creation of an Arab-Palestinian state to be used as a launching pad from which to destroy Israel. 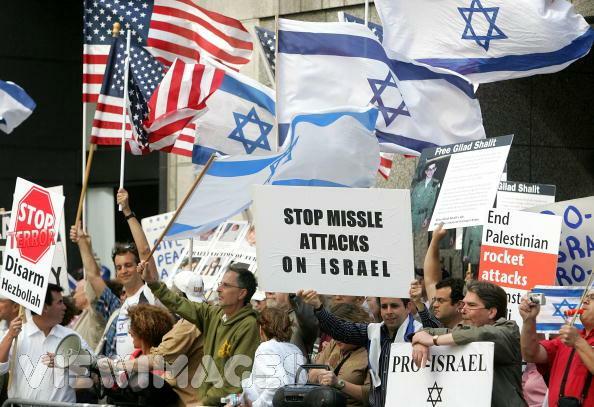 Different strategies – same ultimate goal… a state not along side Israel, but IN PLACE OF Israel. It’s really that simple! “In every generation there are always a few who understand. Please Note: The terms B.C. (Before Christ or Before the Christian Era) and A.D.(“Anno Domini” Latin for “In the Year of Our Lord”) have been replaced with B.C.E (Before the Common Era, or Christian, Era) and C.E. (the Common Era) so as to respect all visitors to this site. The terms are interchangeable and both are based upon the Gregorian Calendar. Israel first became a nation in 1312 B.C.E., two thousand years before the rise of Islam! Seven hundred and twenty-six years later in 586 B.C.E. these first ancient Jews in the Land of Israel [Judea] were overrun and Israel’s First Jewish Temple (on Jerusalem’s Old City Temple Mount) was destroyed by Nebuchadnezzar, king of ancient Babylon. Many of the Jews were killed or expelled; however many were allowed to remain. These Jews along with their progeny and other Jews who would resettle over the next 500 years, rebuilt the Nation of Israel and also a Second Temple in Jerusalem upon the Temple Mount. Thus the claim that Jews suddenly appeared fifty years ago right after the Holocaust and drove out the Arabs is preposterous! Then in 70 C.E. (nearly 2000 years ago), it was the Roman Empire’s turn to march through ancient Israel and destroy the SECOND Jewish Temple, slaughtering or driving out much of its Jewish population. Many Jews left on their own because conditions for life were made unbearable in many respects… yet thousands upon thousands stayed and rebelled on for centuries in order to once again rebuild a Jewish Nation in this Holy Land. Over 3250 years, various Peoples, Religions and Empires marched through Jerusalem, Israel’s ancient capital. The region was successively ruled by the Hebrews [Jews], Assyrians, Babylonians, Persians, Greeks, Maccabeans, Romans, Byzantines, Arabs, Egyptians, the Crusaders, Mamelukes, the Turks (who indifferently governed the backward, neglected territory from the 16th century until the British drove them out during World War I) and then once again by the Jews in 1948. None bothered, nor were they in the least bit inclined, to build a Nation of their own… EXCEPT the Jews! It must be noted that in 636 C.E., when the Arabs marauders came to the land and uprooted even more of its Jews, they did not form any Arab nation there… and certainly not a “Palestinian” nation. They were simply “Arabs” who, as did others before them, moved into a geo-political area called “Palestine!” And remember this one fact… it was not the Jews who “usurped” (a favorite word from the Arab propagandists) the land from the Arabs. If anything, it was the Arabs in 636 C.E. who overran and stole it from the Jews! No nation, other than the ancient nation of Israel and later again in 1948 with the rebirth of the 2nd Nation of Israel, has ever ruled as a sovereign national entity on this land. A mighty Jewish empire extended over this entire area before the Arabs — and their Islam — were even born! The Jewish People have one of the most legitimate Birth Certificates of any nations in the world. Every time there is an archaeological dig in Israel, it does nothing but support the fact that the Jewish People have had a presence there for well over 3,000 years. The national coins, the pottery, the cities, the ancient Hebrew texts… all support this claim. Yes, other peoples have passed through, but there is no mistaking the fact that Jews have always had a continual presence in that land for over 3,000 years. This predates and certain dwarfs any claims that other peoples in the regions may have. The ancient Philistines are extinct. Many other ancient peoples are extinct. They do not have the unbroken line to this date that the Jews have. And if you want to talk religion, fine. G-d GAVE the Land of Israel to the Jewish People. And G-d does nothing by accident! One more thing. Very often one hears the revisionists and propagandists finding ancient historical links between the “Philistines” (“Invaders” in Hebrew) and the Arab “Palestinians.” There is no truth to this claim! The Philistines were one of a number of Sea Peoples who reached the eastern Mediterranean region approximately 1250-1100 B.C.E. They were actually an amalgamation of various ethnic groups, primarily of Aegean and south-east European origin [Greece, Crete and Western Turkey] and they died out over 2500 years ago! Those Philistines were not Arab… and neither was Goliath! The Arabs of “Palestine” are just that… Arabs! And these Arabs of “Palestine” have about as much historical roots to the ancient Philistines as Yasser Arafat has to the Eskimos! The ancient, indigenous inhabitants of Palestine are long perished from the earth. Canaanites, Phoencians, and then Philistines, all were dominated by the Israelites before 1060 B.C.E. Most of these cultural identities dissolved completely by the neo-Babylonian age, or, the 6th century B.C.E. Arabs weren’t even in Palestine until the mid-7th century C.E., over a thousand years later, after Palestine’s 1,300-year Jewish history. Arabs later living in Palestine never developed themselves or the land, but remained nomadic and quasi-primitive.